Keep your phone or MP3 player securely mounted to your car's windscreen or dashboard. The OmniHolder's versatile design ensures a secure fit with an ideal viewing angle in either portrait or landscape positions. Compatible with most phones (80mm width). This holder arrived on time. It is compact, has good suction and easy to adjust for differing phones. I am v happy with it. Arrived within 4 days of purchase and been using it since then. Sticks very securely to the windscreen just can't really figure our how to put it on the dash. Love the adjustability feature for phone size. Holds phone securely and great for navigating. Would purchase again. Sticks to window well only problem is it shakes a bit but does the job. Really happy with this. Holds the phone easily and can be rotated to hold the phone vertically or horizontally. This was a Xmas present and it would seem to have been a great success. Does the job ! This is a great product. Easy to use and sticks well and works either horizontally or vertically. Would recommend. As a van driver who often has to change van it is important the device can be changed easily yet be secure when stuck to windscreen IT IS. Holds my Samsung S8 tightly but also fits the bigger iPhone 6. Attaches really well to Windows and to dash with the supplied adhesive plate. Turns in all directions. Very neat concept and would have done the job really well - but the suction pad simply does not work (and, yes, I do rotate the locking mechanism fully). Disappointing. Seems to do what it says on the can! The suction clip initially kept becoming unstuck but after perseverance and cleaning both surfaces it now has a secure bond. The mount is easy to use and can be adapted to the angle you want so I am happy with this product. Nothing. It does what it says. Super cheap won't hold phone in place, (Google pixel 2 xl) broke removing from glass. Unlocked the lock and pulled from glass and the pad broke out from the back of plastic. A great phone holder. When not in use you fold it together. I bought this one as second one to have one in my car and the other in my truck. You can turn twist or what so ever in any direction. Also the foot plate for on the dashboard sticks perfect. For me no other. Does what you want it to. You must make sure you turn the dial fully or it falls off. Bought one for myself to be used with a Galaxy S9 and one for my wife with an IPhone. Both phone are too heavy and wide for this mount. When I squeeze the Galaxy into the mount the arm just collapses under the weight. Definitely the worst mount I have purchased and will be replaced asap. We have tested the Omniholder ourselves and it holds iPhones and Samsung phones absolutely fine. Please make sure you are using the suction cups clamp correctly and the sides are also adjustable. Any more issues, please contact our Customer Services department. Bought to use satnav with hire car abroad. Fell off before first corner and wouldn't stick back. I took a 2400 mile round trip and this held up well. It only fell off the windshield once, but nothing that a lick & stick couldn't solve! Although this came up in my search as compatible with Google Pixel 2, I was unable to get my Pixel 2 to mount securely due to the central proximity of the Pixel 2's volume button on the right hand side of the phone. The only way was to use the clamp further down the handset, which then only worked in landscape mode when mounting the holder on the windscreen. This setup caused a lot of handset wobble when driving, probably due to the uneven weight distribution with the phone being mounted lower down. Recently, one of the soft pads inside the clamp started to peel off, and then the the dial used to clamp the suction pad to the windscreen came loose, and I haven't been able to get it back on and use the holder since. All a bit disappointing really. Simple to use and works well. I just need to be a bit careful putting my phone in the cradle to make sure it doesn't interfere with he volume controls. Easy to use, applied to windscreen no problem, stayed fix with mobile attached( even over bumps and lumps in road) all stayed stuck on windscreen. Not used the adhesive pad for shelf. I bought this on a BOGOF deal - mainly to get one for my wife's car. It comes with a pad to stick on the dashboard allowing a good union between the otherwise "dimpled" dashboard surface and the suction pad on the phone holder. It can also be attached to the windscreen - which is how I use it. It is made from the generic commonly used plastic so has that typical cheap feel, but appears to be sturdy enough, although I have not had it long enough to really judge it's longevity. The grip is spring loaded an it does press the buttons on the side of the phone (I have a Samsung S6) if not positioned carefully and the spring is quite stiff which does mean it grips well, but also that you really need 2 hands to mount the phone and even then it can feel as if you might snap the holder. Overall it is good, the price was good and time will tell whether the concerns expressed above (and hence only 4 stars) are warranted. Small and compact but holds the phone well without too much vibration. I'm very pleased with this holder. It takes two hands to get it in and out but then I'm using a wide and heavy duty Olixar case on my phone and I need to ensure the almost-central Bixby button isn't pressed by the arms. The product was up to my expectations. pretty average, a bit disappointed. the suction cup is strong and the grip on the phone is great. The friction lock on the ball joint became weak in less than a week. I regularly need to tighten the phillips screws as it begins to droop down after ~2 days of use. A huge hassle.. Please, could you contact our Customer Service team so we are able to investigate this further for you? able to rotate it. Easy to use. Product worked well with my Google Pixel 2 XL during the first few days but then it started to lose suction after a week. The arm that was a supposed to be holding the phone can no longer stand straight and the cushioning pads on the holder came off after a week, must have been some pretty dodgy adhesive. Overall I'm not too particularly impressed. I was very pleased with my purchase it was as described and came promptly. This is the second of these I have bought. What I love about it is it is so compact and looks great. It has a short neck so doesn't stick out like some do. Easy to fix and rotate to portrait if required. In fact it will rotate in all sorts of directions to fit any dash/window configuration. Now I have to say the first one refused to stay stuck to the pad that is affixed to the dashboard. I cured this by a few drops of superglue on the rubber. This second one has stuck so far without the glue but I have my doubts if it will stay on in the summer when the dashboard sticker gets really hot in the sun. Overall I really love it for it's looks and ability to snap your phone in or out of the holder, rotate and it's solid too. A five star product! A good product which does exactly what it is supposed to do. I bought this product to hold an old smart phone on which I had downloaded a dash cam ap. The holder needed to be small, solid and not prone to overmuch movement once affixed to a dash mat. It also had to allow a clear view for the camera lens. It is performing admirably and I'm sure would be just as good for holding a sat nav. or just a 'phone. For the money, it's on the money. Absolutely brilliant phone holder the best one so far. Was sold as suitable for a Nokia 640xl. The phone only fits with a squeeze, which invariably detaches itself from window. Unlikely it will last long but we will see. Phones with buttons on the side I.e. Nokia, can only be held at bottom of phone thus making phone wobble like a bobble head. Usable but maybe better for smaller, lighter phones. Fine gear, sent very quickly to me. SImple and elegant design fitting perfectly in my car. Would be great in my boat as well. Okay - when it works! I read the reviews and watched the You Tube instructions video however found this product doesn't always work. The mount mechanism can be temperamental, resulting in my mobile detaching from the windscreen and being damaged. Not happy. Sorry to hear about your problems with this product, Could you double check that mount is screwed in tight to the window screen. Also have you tried running the suction cup under water and allowing it to dry? This will restore the suction capabilities of the mount. If you have anymore problems please contact our customer services. Best Phone Holder on the Market! This product is definitely the best phone holder out in the market. I had been on the search for a new phone holder since i got my new car back in 2016. It has a very slim profile so it allows me to mount my phone in awkward areas such as underneath the driver side air vent. 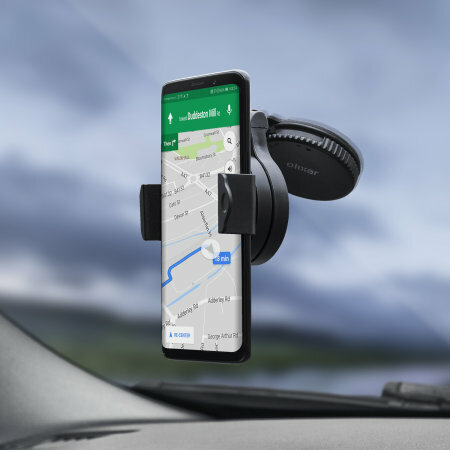 The phone holder can also rotate in all direction which is very useful if you like to view your navigation in landscape. The phone holder is very strong and secure so if you do go around a harsh corner your phone will be fine. If you're looking for a new phone holder and don't like the new magnetic phone holders like me, this is definitely the product for you. This is the second time i have purchased the product so i have one in each of my cars. It is also very valuable for the cheap price it is available for. The quality of the product is definitely worth the price. Overall, it's a phone holder i would recommend to everyone. The mount would not stay on winscreen or other glass surface for more than a few minutes making it unusable. I have a HTC U11. The mount grabs it securely enough in it's case, but it can tend to press the squeezable sides of the phone launching apps when inserting. The biggest issue I have is that I want to use it as a windscreen mount. The arm is too short on the mount meaning the phone is too close to the windscreen to allow a reasonable viewing angle. It might work better if your windscreen has a steep rake angle such as a truck, jeep or bus. When the phone is mounted , it tends to vibrate and deflect when you try touch the screen. Clever compact design but it could use stronger plastics. I had a HTC M7 OEM mount before and it was rock solid. Product arrived in good condition and well packaged. Prefect for Samsung note 8 and good view. This has got to be the best phone holder I have ever had it’s easy to use very strong I’ve been so impressed with that I have bought four for my family alone and I have recommended it to lots of my friends phone never slips out and it always seems very secure on what ever surface you use it on Try it and you will see is the best. great product and price, it does what it says and does not fall off like a lot of other products out there. Position it anywhere you like in your car, haven't tried the adhesive patch but didn't need to as the window grip was excellent, to device can be angled as you need it and holds my phone firmly. Its still where I put it a fortnight ago, and you can't beat it for value for money. Great product, well made, very competitively priced and super quick delivery to Spain. The item arrived on time and works perfectly. The item is fine. I don't kmnow how it could be improved. Could have done with instruction leaflet on how to use. Quite a nice piece of kit. I was impressed by the strength of the suction of the device and it is quite a solid build that looks like it will stand the test of time. A tight fit for my Moto g4 could be made a bit wider to accommodate todays larger phones but basically happy with my purchase. Easy to to use, neat phone holder. Turns to either vertical or horizontal. Can't fault it. Works like a dream. I had this for a year before the sticky ran out. Given the price maybe that's fair but I was disappointed. Now I think it might be useless. It's an aggressive holder so it won't drop your device but will want to press side buttons. Lots of these devices around but settled on this one and glad I did. Easy to set up and phone fits well. Good buy. I mounted this on my dash. It holds a 5.5" cell phone solidly. The ability to set a variety of positions is fantastic. I would recommend this to anyone that wants to mount a cell phone holder to a dashboard. Note that there is an adhesive backed base which the suction cup adhere's to. I'll probably purchase another for another vehicle. I've only hade the iPhone mount a few days but as far as I can tell it will do a good job - hopefully for a long time! Gives great flexibility of movement and seems secure. My only criticism is that when the item was delivered to my work address as requested it came without my name on the package. The person who received the parcel didn't know who it was for. I did receive it eventually. Had it for around a month and its performing very well - versatile fixings and tough. I bought the Olixar Omniholder because very occasionally I want to use my smartphone as a Sat Nav. This wont happen very often so I didn't want to spend a lot of money on any device. Also I didn't want something that is glued to the dashboard nor slotted into the air vents (these vents are not always in the best place for your device). I've given it just 4-stars because it isn't Rolls-Royce quality, but will be good enough for occasional use. I can keep it in my glovebox in case I need it. My Nexus 5X has a "book" cover on it, and it looks as though I will have to remove the phone from its cover to insert it into the Olixar; not happy about doing that but as I don't expect to use it very often I can put up with that. The product does what it says, excellent for the car. one with a protective cover it was a tight squeeze to fit in to the holder. Shakes around quite a lot when driving. Overall happy but purchasers with larger phones should consider the above. Bought it for my wife's car. Suction base sticks well to a smooth surface on the dash. Looks like it will have a good grip on a phone, and can easily turn from portrait to landscape. Won't hold big phones (eg. 5.5in) but good for normal size (eg. 4.7in). No good for IPhone 6S Plus. The ribbers move an phone just falls out!! Great little holder!! With my VW jetta having not a lot of space to suction a holder too, this holder was able to fit. With heaps of movement I was able to put it in the perfect location. Will recommend it to anyone! Bought this and its been great. I couldnt fix it to my screen (it fell off a first attempt) but tbh I was in a hurry to leave home that day and havent tried since. Its affixed to my dashboard instead. I quite like it for being able to rotate it to whatever direction suits and also being able to charge my phone whilst in the cradle. All round winner. I gave it 4 stars as I couldn't straightaway stick it to my windscreen. Item was received promptly and well packaged. It is easy to mount and use. My Lumia 950 XL fits on it well, even with it's protective cover on. But it feels a little heavy, I hope it will stick. Have yet to try it on the road. Doesn't really fit my iPhone 7 Plus. Falling apart. Okay, so my iPhone 7 Plus with an Otterbox slim case does not really fit into the holder. I literally have to lever the phone into the holder. Because of this, the adhesive pads started to come off almost straight away. Other than that, the holder bounces a lot when driving. It can be quite distracting. First use just today and all fine. I found it needs a good firm press against the windscreen before locking in place. Also the natural fit position is halfway down the phone but on mine that is where the volume button is so I mounted it lower - which when using the phone in landscape positon makes it slightly wobbly as the mount is off-centre. But it stayed in place. When I read the description stating the in-car mount could accommodate mobile cases, I thought my Apple Silicone Case for iPhone 6 would be included. After driving a couple of miles on the first use however, the in-car mount lost suction and my phone fell. This startled me as it was unexpected. I simply removed the case and it has since worked a charm. I like the way it tilts. It's inconvenient removing and inserting the Apple Silicone Case for driving but not much of a hassle to warrant not using it. 5* driving without the case in-mount, 1* with. Excellent product, easy to use, far exceeds expectations, better than others on market.